John Shykun, one of the founding fathers of the electronic keyboard, worked on the ground floor of synthesizer development with Aarp, CBS-Rhodes, Kurzweil, Ensoniq and General Music. He brings an impressive level of dedication and professionalism to church musicianship. A former keyboardist for Neil Diamond, John is an outstanding improvisational player with a seemingly unlimited repertoire of classical and modern Christian music. Pam Brydon graduated from UOP with a major in math and a minor in music. She got a secondary credential in math and music and taught high school and junior high before “retiring” to raise 2 children. She got her masters in music at Chico State, performing with opera workshop and several choirs. She then directed the choir at the First Christian Church in Chico and taught math at Butte Community Church. 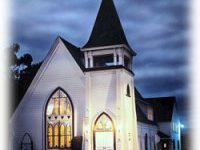 Since moving to Pacific Grove she has directed the choir at this church.